I was unlucky to get one of the older rooms my friend was put in one of the newer ones and it was much nicer..
All amenities provided - coffee maker with the possibility of buying capsules from reception, microwave, electric stove, extra blankets, etc. The decorations are fun. It is very nice that the room had a kitchen and table. The hotel had a lot of personality and it was cool to be in an area where locals live. It was very easy to get to from the airport and there were several restaurants and banks nearby. They were also very accommodating as I arrived much earlier than check-in time. They held my bags in a secure room which allowed me to go elsewhere until I could check in. Our room was cleaned every day. The bed was very comfortable and it was great to have a small kitchen attached. The staff were very helpful and friendly too. Good location near a metro station and a nearby parking garage, friendly staff and cleaning ladies. It's basically an hotel room with a kitchen so you can have daily cleaning if you want. Good wifi, warm room. Breakfast was good. I like there was muesli not only cruesli. Choice of pillows. Good bed. Lots of space. Table and chairs so that I could work on my laptop. Refrigerator that worked. Nice to put our own drinks in. Close to metrostation. 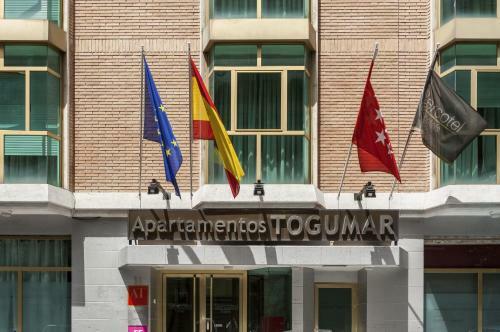 Lock in a great price for Apartamentos Sercotel Togumar – rated 8.3 by recent guests! Apartamentos Sercotel Togumar This rating is a reflection of how the property compares to the industry standard when it comes to price, facilities and services available. It's based on a self-evaluation by the property. Use this rating to help choose your stay! 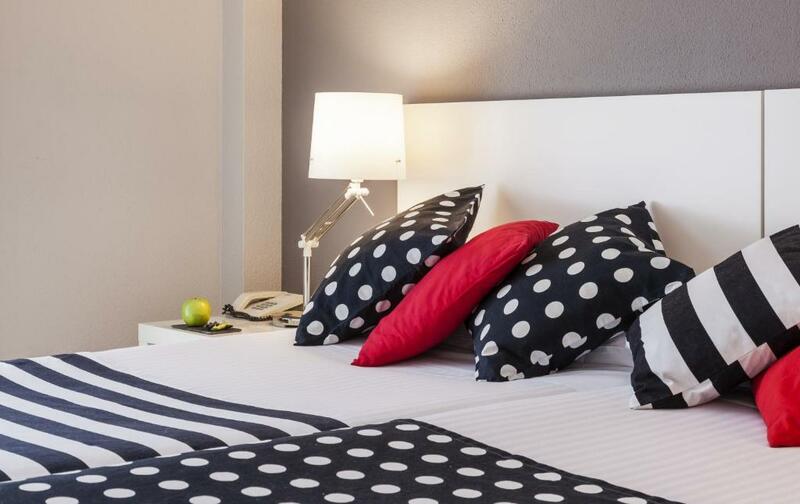 A 2-minute walk from Prosperidad Metro Station, Apartamentos Sercotel Togumar is 2,450 feet from the National Auditorium and a 15-minute walk from the Santiago Bernabeu Football Stadium. Free WiFi is available. The air-conditioned rooms at the property have simple, traditional décor and include a kitchenette with a fridge. Parking is available on site for a surcharge. Guests can enjoy a welcome drink. A cold buffet breakfast is served in the café for a charge. Juan Carlos I Exhibition Center is a 20-minute metro ride from Apartamentos Sercotel Togumar, while Barajas Airport is just 6.2 mi away. Guests can reach Madrid city center in less than 30 minutes by Metro. When would you like to stay at Apartamentos Sercotel Togumar? 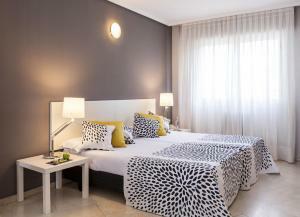 This spacious and bright air-conditioned room features a TV, free Wi-Fi and a private bathroom. This triple room features air conditioning and a seating area. Sercotel Togumar offers an unique experience to enjoy your stay in Madrid. If you are traveling with family, friends or even for professional reasons, you will have everything you need to feel almost at home. Our staff works every day to make your stay the most enjoyable. We will be glad to help you in everything you need: plan your arrival, book a restaurant... anything you wish, we can make it real. We are located in the neighborhood of "Prosperidad", a nice quiet central location, very well connected to the city center by bus or subway. If you want, in just 20 minutes you'll be walking around the "Puerta del Sol". House Rules Apartamentos Sercotel Togumar takes special requests – add in the next step! Apartamentos Sercotel Togumar accepts these cards and reserves the right to temporarily hold an amount prior to arrival. Please note kitchen utensils can be requested at reception and at no further cost. Please note the dinner in the room and late check-out are available for a surcharge. Pets up to 7 kg are allowed in the property under request, and carry a surcharge of EUR 11 per day. Please contact Hotel Sercotel Togumar for more details. If you're travelling for business, I don't think that's an optimal solution. The hotel doesn't have a restaurant, nor it has a bar and both are great benefits when getting back to your room after a long day of work. The neighbourhood doesn't offer much. The shower is comparable to what you might find in cheap London's hostels. The mattresses should be changed, they are old and uncomfortable. The price 110€/night is exaggerated. In the night you have to look for the switch to turn on the lights in the hallways in the dark. The lights should be managed by a sensor. The lady in the breakfast room is the best. She deserves a 10! :) Basic but good breakfast. The mattress was too soft, it sagged in the middle, the noise of the air conditioning and water from other apartments was loud at times. It was an hotel room with a kitchenette, not an apartment and it was not prepared for being used to cook meals. The exhaust fan didn't do a thing besides noise. Even keeping it on for 2hrs after dinner, it still smelled a lot and we are talking about some chicken steaks and rice, not something too elaborate. Also very few things to cook, should have at least a base for the pans and some extra stuff, without needing us to pay a 20€ deposit for it. The fridge needs a new handle for the door and an entire new door for the freezer part since it's not there. It's an apartment, it should be equipped with the basic from the start, specially since it's how they advertise it. It was an appartment but there were NO pots/pans or any cooking equipment except microwave oven and plates, forks and knives but we did not need any of these so for us it was no problem. No cattle to heat water which was a bit weird as there were teabags and powdered coffee. I assume they thought we would heat water in microwave. Small tv but I never watch tv so no real problem. Neighbourhood was not so clean. Lots of Rubish in the street, not randomly, but at official place to leave rubish and it was cleaned up every day but then during the day it overflew againand it smelled. Very basic room. Very dated bathroom.